A theatrical performance suitable for children between the ages 6 and 12. 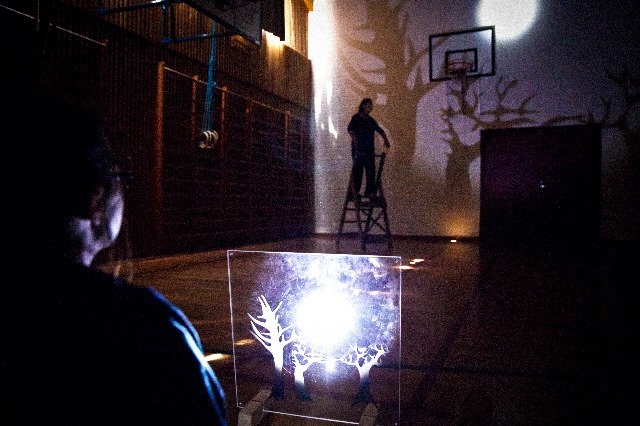 Using a number of narratives, Grete Sneltvedt and Eve-Marie Mansnerus create a new and complete story about the passage of time and transformations. This story includes narratives about a girl who disappears into a wall, a duck who gets to play with Death, an old man who has lost his eye, and much, much more. A woman enters the stage pushing a pram. Inside her pram, she has a variety of letters, words and small texts. She needs to rock to create order and find the right connections for making good stories. In the room she enters there is also a large book, full of figures that emerge as shadows to create the different sets for the action. The children’s books Great Grandfather’s Eye by TONE KJÆRNLI, Nice by GRO DAHLE and The Duck, Death and the Tulip by WOLF ERLBRUCH form the basis of this performance. Ravn is created by Eva Maria Mansnerus and Grete Sneltvedt (both of whom are on stage during the performance), dramaturgist Hector Eguia, choreographer Silvana Barbarini and lighting designer Marco Guidi.